Mitral regurgitation, also known as mitral insufficiency or mitral incompetence, occurs when the heart’s mitral valve fails to close tightly, causing blood to leak backward inside the heart. This leakage can increase blood volume and pressure in the left atrium, which can further increase pressure in the veins leading from the lungs to the heart. Left untreated, it can eventually lead to an enlarged heart, and in more severe cases, heart failure. While treatment for the condition can include medications to help manage symptoms, repairing or replacing the valve typically requires open-heart surgery. For patients who are not candidates for open-heart surgery, due to their age or other underlying health concerns, transcatheter mitral valve repair (TMVR) with MitraClip therapy is now an option. Unlike surgery, the MitraClip procedure does not require opening the chest and temporarily stopping the heart. Instead, doctors access the mitral valve by guiding a catheter through the femoral vein in the leg to reach the heart. 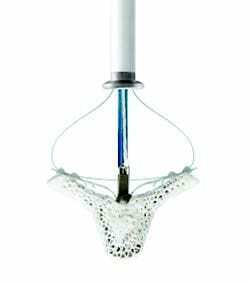 They then clip the dime-sized MitraClip onto the valve, allowing it to close more completely to help restore normal blood flow. Because the procedure is done through a vein and not an artery, recovery is typically much faster. Patients can often go home the next day and resume normal activities shortly thereafter. Clinical data shows patients who underwent the MitraClip procedure demonstrated an immediate reduction of mitral regurgitation and a low hospital length of stay of 2.9 days. They also reported a 73-percent reduction in hospital visits for heart failure. Many patients report experiencing almost immediate symptom relief following the procedure, with their lifestyle greatly improved. The ideal patient following the procedure will find they are able to do more, are subsequently able to exercise more and, as a consequence, are able to improve their overall cardiac health. St. Peter’s Hospital is a ten-time Top 100 Cardiovascular Center in the nation, a three-time Top 10 Percent of America’s Heart Surgery Hospitals, a recipient of Women’s Choice Award for America’s Best Hospitals in Heart Care since 2015, and a Designated Heart and Stroke Emergency Center by the New York State Department of Health. LiveSmart: Hernias – When Do You Need to See a Surgeon?